It was Steph & Aarons 1st Valentine together so she wanted something special and this is what I came up with. Easel card with a photo of them both ( aint it cute). I cut hearts out and Aarons name also Be mine and stuck a few white pearls down really happy how this turned out. It was also this couples 1st Valentine too and once he seen the card I made for his mum which is further down he wanted me to make him one and this is what I came up with. Another cute piccy of them. Inside of card the card is kept closed with using velcro circles. I added a couple of verses with diecuts around it. Full card opened. He wanted something special so here it is I enjoyed making this card remember the early days of my relationship with hubby mind you I wasn't crafting when I first met him. Now for Pamela's Valentine card to her Hubby Alan. Wanted something special and he liked Vinyl ( records not the crafty vinyl for cutting machines ha ha) and he loved music so I came up with this. I added the photo's to the vinyls and used music sheeets for the backing .The card is 8x8 but has 7x7 card on front.which is closed with ribbon which you can see. I added a few different dies and black gems to the card. Inside of main card with verse. inside of card on front with another photo verse and die cuts. I really like how this turned out I am really happy with all finished cards and that everyone loved their cards. Card I made for Tyler to give to his Headteacher. I used stampin up inks, mask stencils. Card I made for Logan to give to his Headteacher. 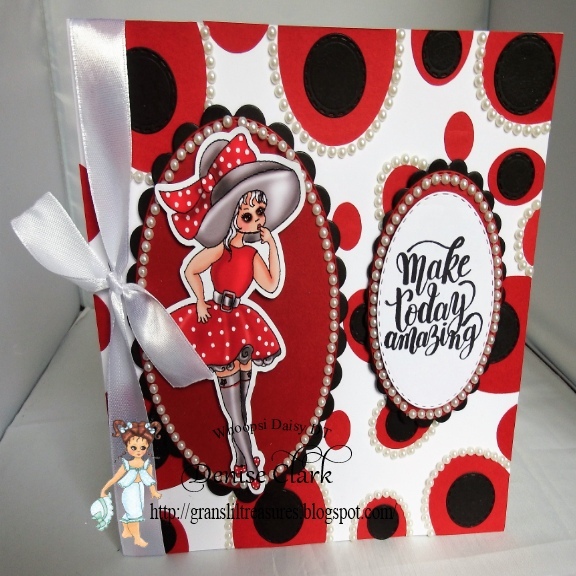 I love how this turned out with using stampin up inks and 2 different masks. Front view of the Chocolate wrapper. I got 2 different kinds of chocolate and just resize the wrapper. Happy Birthday Papa card. Card designed in CA ( craft artist 2) printed of on matt Ice paper . I used square star die cut parts of it out and used for 2 corners. Happy Birthday Dad card. Card was designed in CA ( craft artist 2) My friend wanted a garden with flowers as that what he likes so came up with this. The challenge has started over at Whoopsi Daisy Challenge this month is anything goes challenge with an optional theme choice of love. The challenge ends noon EST on Sunday, March 3. Why not give it a go and pop on over to http://cutedaisymay.blogspot.com/ and give it a go. My background paper was already in my stash, I added this cute Elephant image, isn't it so cute. I thought it was the right image to use and goes well with the design. I cut out small hearts and Butterfly from the Gemini die range. I added tiny red gems onto the heart and to the butterfly. 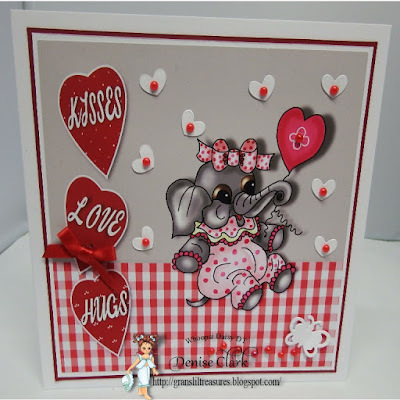 the big love hearts are on the backing paper to I just added kisses, love and hugs to them and a red bow to the middle. Mat and layered with with and red card onto the white base card. for his birthday. I designed the cards on my CA (craft artist 2) and this is what I came up with for him from his brother and his Granda and I. Here is the Banners I made also designed in CA (craft artist 2. I was happy with the outcome of them all and even more happy when the Birthday Boy walked into the Livingroom with a massive smile on his face. It makes it so worth while to have a buzzing head to figure out what to do and knowing you've made one boy very happy. Card Girl Basket Eggs " Dt Lemon Shortbread "